"This recipe has been in my husband's family for several generations. His aunt gave it to me when we were married 45 years ago. Everyone loves it." In a medium bowl, dissolve the gelatin in the boiling water. In another bowl, mix together cream cheese, celery, avocado, 1/2 cup mayonnaise, and salt. Mix in onion juice, if using. Gradually stir in the gelatin mixture. Pour into an 11x7 inch glass baking dish, and refrigerate until set. 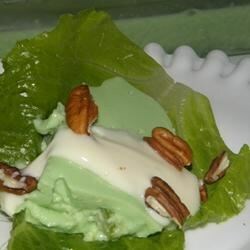 Cut the gelatin salad into squares, and serve each square on top of a leaf of butter lettuce. Make the salad dressing by mixing the 1/2 cup mayonnaise with confectioners' sugar and lemon juice to taste. Drizzle dressing over squares, and garnish with toasted pecans. Place raw pecan halves on baking dish. Dot with Butter and sprinkle generously with salt. Bake at 250 degrees F (120 degrees C) for 1/2 hour, stirring occasionally. Drain thoroughly on paper towels.